Arsenal say striker Danny Welbeck has undergone a second operation on his broken right ankle, but that it's still too early to say when the England international will be back on the pitch. 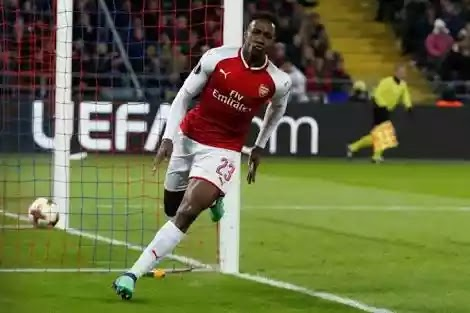 Welbeck had his first surgery on Friday after breaking his ankle during Thursday's Europa League game against Sporting Lisbon, and the club issued a statement on Monday evening saying the striker "has undergone a second planned operation on his right ankle." "Both procedures went well, without complications. Danny will now recuperate and start his rehabilitation. It's too early to say how long this will take," the club said. "Everyone at the club will now be providing Danny with the best possible treatment and support in order to make him fit again as soon as possible." Welbeck had to be given oxygen on the pitch and was carried off on a stretcher after a gruesome injury, with images showing his right ankle bent an unnatural angle. It remains unclear whether he will be able to play again before his Arsenal contract expires next summer. Goalkeeper Bernd Leno said the squad talked to Welbeck via FaceTime before Sunday's Premier League game against Wolverhampton Wanderers at Emery's suggestion. "He looked very happy and I think he was happy to talk to us because he is still a big part of our team and we will support him to have a good time when he is injured," Leno told the Arsenal website. "We all are sorry for him for his injury, and hope he will have a good recovery and to see him on the pitch because he's an important player for the team and also in the dressing room. "I think that [togetherness in the squad] is a big quality of the manager because he always wants to have a team -- not just one player, one player, one player. I think this meeting was very motivating for us and for every player to play for Danny because everybody likes him."